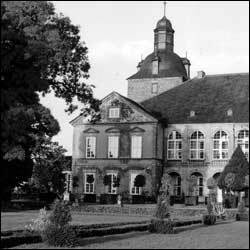 The varied history of the construction of Hundisburg Palace can best be experienced in the south wing, which is the only part where the historical interiors have been preserved. In the stairwell, visitors are immediately struck by the rough stone masonry of the Templar tower built in c. 1200. In 1568, sumptuous living quarters were arranged in the keep. They were connected to the Old Palace built in 1544. Starting in 1693, Johann Friedrich von Alvensleben developed these older sections into the Baroque palace dominating the entire ensemble and whose basic structure has been preserved to the present day. Sadly, the vast majority of the interior design for which he was responsible was lost due to first alterations and then the fire in 1945. Merely the palace restaurant and the rooms above it provide an indication of the Baroque splendour which once prevailed here. The Loock and Apel collections displayed upstairs more than make up of the items which were lost. The former is a collection of paintings from the 16-19th centuries; the latter features works by Magdeburg sculptor Heinrich Apel, together with exhibits by his teachers from the Halle School, who were influenced by the Bauhaus movement.